Listening to the 2009 remasters of The Beatles catalog is similar to getting your very first pair of glasses: you don’t know that things are out of focus until you actually experience 20/20 vision. 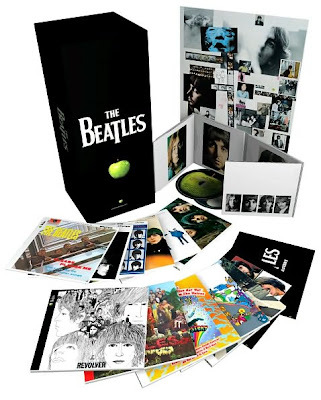 I’ve listened to the Beatles catalog in practically every format, from LP, 8-track, cassette and 7” vinyl to the CDs that first hit the market in 1987. I’ve also viewed their movies on the big screen and at home (on VHS and DVD) plus I’ve heard my fair share of bootlegs as well. But I have to admit that nothing compares to listening to these new stereo remasters! Now, bear in mind that nothing here was remixed. All the songs are the same mixes you’ve been enjoying for decades, but they’ve been dusted off and given a new car shine. On almost everything here, the vocals really leap out at you. For example, George’s vocal presence is much more obvious in the harmonies on the pre-Sgt. Pepper albums. Where once I heard John singing lead aided by dual background harmonies (with Paul the most dominant voice), now I hear John singing lead with Paul and George supplying harmonies! Each voice is distinct and crystal clear. Even Sgt. Pepper onwards, you can hear so much more. The voices still blend together, but it is all much clearer. It’s like all the haziness that you didn’t know was there is now gone! Instrumentally, it all sounds amazing. The handclaps are crisp. The guitars ring. The piano sings. The drums kick. The stereo separation is superb and the left and right channels don’t bleed together as much as they used to. The tape distortion that was slightly evident on certain tracks is gone. You can even catch a few mistakes that have always been there but are definitely more obvious than ever before! And, I know it sounds cliché in regards to CD remasters, but I’m hearing things I never noticed before, from percussive instruments to voices and even guitar licks! And trust me, I’ve spent 45 of my 45 years listening to (and dissecting) the music of the Beatles. But with those little things, I’ll leave it up to you to find them. I am sure your journey will be similar to mine, but each of us will experience it differently. Enjoy! P.S. And I still think that voice says ‘I buried Paul’ at the end of “Strawberry Fields Forever” and NOT ‘cranberry sauce’ as some have claimed!